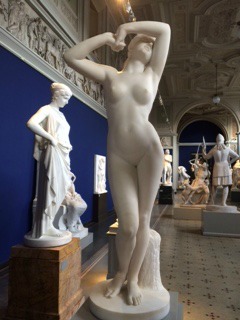 Took a short trip to Copenhagen to visit a few of the galleries it had to offer – I was not disappointed! 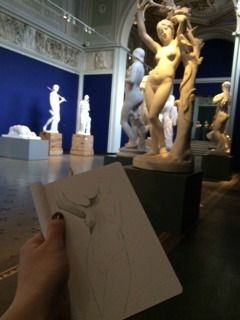 The Glyptoteket was by far my favourite, I think I spent about 3 hours in there altogether. In that time I managed to get a few drawings done of the many statues in there, which sparked off further ideas for my project. The trip was very successful, it has given me inspiration and has introduced me to an artist I had not heard of – Auguste Rodin. There was a special exhibit on at the SMK National Gallery Of Denmark, showing plenty of his drawings (despite him being known primarily for his sculptures). These drawings were of couples or of women in provocative poses – very fitting for my project. 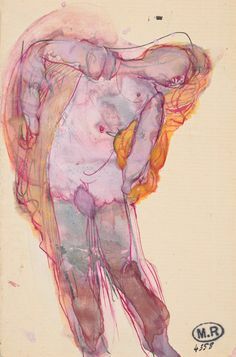 The texture within his drawings/paintings reminded me of the texture found in silk materials, with watercolours used on them. Here is an example of his work, depicting a woman in her underwear.